Monday, April 15 at 11:30 AM. 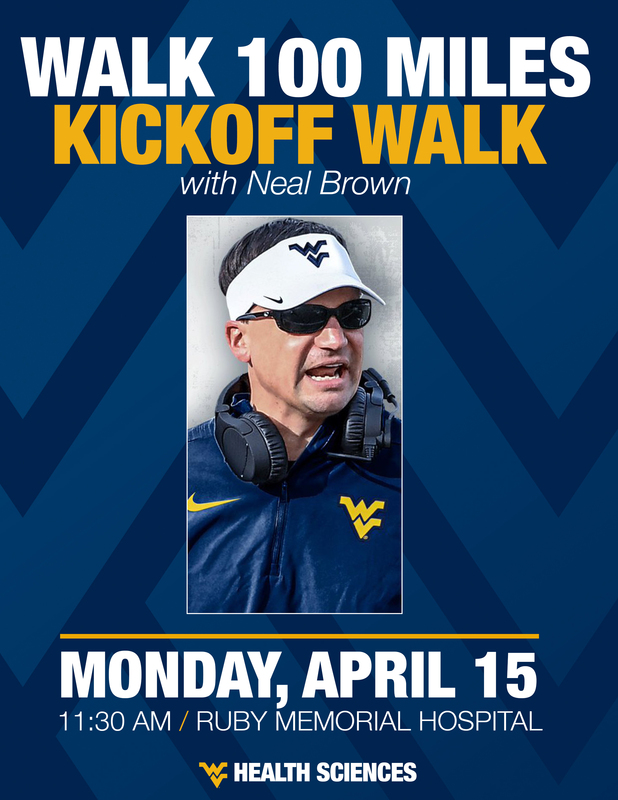 This year’s walk will be led by WVU Head Football Coach Neal Brown and the Mountaineer Mascot who will sound the start of the walk by firing off his musket! Please join The Wellness Center team for a one-mile kick-off walk around the WVU Health Sciences Campus starting from the J.W. Ruby Memorial Hospital Lobby. Please meet in the lobby at 11:00 AM for photo opportunities. All are welcome so invite your friends, family, and co-workers to participate! Registration Reminder: Employees need to have their walking teams registered online and submit t-shirt fees to The Wellness Center by Friday, April 12. For more information, please contact The Wellness Center at (304) 293-2520 or wellnesscenter@hsc.wvu.edu.